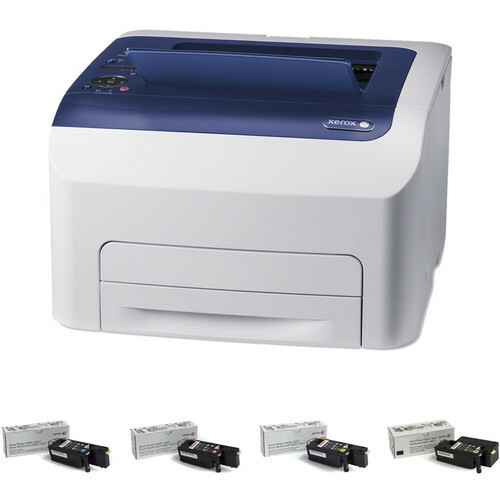 Maximum Print Size: 8.5 x 14"
Minimum Print Size: 3 x 5"
Print out documents and images with ease by picking up this B&H Kit which features the Xerox Phaser 6022 Color LED Printer along with an Extra Set of Toner Cartridges. This printer offers full-color printing when needed and features a print speed of up to 18 ppm. Print wirelessly and embrace high resolution 1200 x 2400 dpi enhanced imagery with the Phaser 6022 Color LED Printer from Xerox. Able to deliver up to 18 ppm, this capable unit will dramatically improve the productivity of your home or small office. It features a 150-sheet input tray which can handle all of your basic document sizes from 3 x 5" index cards to legal-size 8.5 x 14" documents. It is also quick to get going with a first print out time of 12 seconds. With built-in Wi-Fi users will be able to print directly from their mobile devices using Apple AirPrint, Google Cloud Print, Mopria-certified applications, and Wi-Fi Direct. The printer is capable of handling numerous large jobs thanks to a monthly duty cycle of about 30,000 pages. Additionally, it offers both USB 2.0 and Ethernet in addition to Wi-Fi for enabling a variety of different setups. The Cyan Toner Cartridge for Phaser 6022 & Workcentre 6027 from Xerox yields 1000 pages and is designed for the Phaser 6022 and WorkCentre 6027-series printers. The Magenta Toner Cartridge for Phaser 6022 & Workcentre 6027 from Xerox yields 1000 pages and is designed for the Phaser 6022 and WorkCentre 6027-series printers. The Yellow Toner Cartridge for Phaser 6022 & Workcentre 6027 from Xerox yields 1000 pages and is designed for the Phaser 6022 and WorkCentre 6027-series printers. The Black Toner Cartridge for Phaser 6022 & Workcentre 6027 from Xerox yields 2000 pages and is designed for the Phaser 6022 and WorkCentre 6027-series printers. Box Dimensions (LxWxH) 19.9 x 19.8 x 14.9"
Box Dimensions (LxWxH) 7.0 x 2.7 x 2.15"
Box Dimensions (LxWxH) 7.05 x 2.7 x 2.15"
Box Dimensions (LxWxH) 7.0 x 2.7 x 2.2"
Box Dimensions (LxWxH) 7.0 x 3.3 x 2.5"
Phaser 6022 Color LED Printer with Extra Set of Toner Cartridges is rated 4.4 out of 5 by 41. Rated 2 out of 5 by Susan H from Compact laser printer with good print quality but unreliable and did not last Wireless worked for a week or so after I set it up then suddenly stopped working. Eventually I gave up and plugged it in. Printer had a very annoying habit of not waking up after it went into power save mode. I would hit print but nothing would happen until I turned the power switch off then back on again to reset it. During the course of a day I would have to do that about 10 times. Yesterday I went to print and a message came up to clear a paper jam. There was no paper jammed in it. Spent an hour fishing around inside the machine but definitely no paper jam. Now will not print at all and it is only 15 months old. I would not recommend. Rated 5 out of 5 by CJS0823 from Perfect color laser printer I purchased the Phaser 6022 to replace an inkjet printer. I had become very frustrated continuously buying ink for the inkjet. This printer has good image quality and it being wireless network ready are it's best features. I will look to Xerox again for my future printing needs. Rated 5 out of 5 by EAC from Easy to use, quiet and fast Purchased to replace a inkjet, because I don’t print everyday or even every week, my inkjet would clot up and nothing would clean it , Decided to try a toner printer as I was told it would not dry up or clot like a ink jet. On receiving the printer It was a little larger then I expected, but still a small printer. Thre paper tray keeps the paper feed straight, I had problem with this on all the small inkjet I had. Easy to set up, it is very quiet and faster with great print. This printer was more then I was expecting for the price. I am very happy with this printer and would recommend it for any small business or personal use. Rated 5 out of 5 by Jenn from I researched a long time I did alot of research before deciding on this printer! I like that it has the option to print in black/white only and save on toner and that when the black runs out I dont have to replace the color also! The printing quality is superb and the setup was quick and painless! I'm very happy with my purchase! Rated 2 out of 5 by Rich from Quality of prints is very good, reliability is very questionable Had this printer for 2 1/2 years, and when it worked it was great. As a direct USB-connected printer to one PC, no problem (mostly). As a network/wifi printer....forget it. Yes, it will work flawlessly for a while, then decide to do its own thing sooner or later. I've tried it all: wifi/wifi direct, ethernet, USB, etc. It will work fine and dandy then suddenly won't connect to any PC in the network. Resetting the settings, connections, method of connection - you name it, will fix it temporarily then it just does its own thing again. I've been very patient with this printer for the past couple years, finally had it. Giving it away. I found out later quite a few others have had the same problem with this printer. Rated 1 out of 5 by Les from Worked only a short time I am having the same issues as bunkie from Montana, after about adozen color copies it gave me the yellow cartridge needs replacing I Bought a generic on big on line store put it in and then it said replace magenta, customerservice sent me a replacement magenta, machine then said replace yellow, printed three copies and we are back in loop again , I think it’s a software problem, have tried with all new generics and originals, loops to turn off reinstall calibrating, why Do replacements have electric contacts where as the original ones do not,? When it worked I liked it, it just won’t work for now. Rated 5 out of 5 by maestrosteve from Way better than a color inkjet printer I bought this color laser printer because of the Xerox name, history, and quality of the hardware. The cost was comparable to a higher quality inkjet, and I was looking for high quality. I like the print quality. It's not photo quality, but I don't print photos so it's not a concern for me. I have a Xerox Black and White Laser Printer which I do most of my printing on, so while I use this one sparingly when I need to have some color, I don't have to worry about drying out and clogged ink nozzles like I would if I had purchased an inkjet printer. I could turn it on after not using it for 3 months and be worry free, it will work. I have this hooked up wirelessly to my home computer. It also prints well on heavier than normal stock paper. I'm very happy with the purchase. Rated 5 out of 5 by Anonymous from Legendary quality, technical, sales, and customer support. I have operated XEROX products since the platen glass was round. All the high speed printers. Several years in commercial and educational engineerering. In retirement I wanted laser, non-scanner, non-email device that was wireless and small. Every part of the process of purchase was attentive to my needs and wants. Set up required technical support which was excellent and astonishingly quick and successful. Less than 10 minutes. Purchasing through XEROX was the only option. Other vendors were uninformed about the need for a wireless adaptor for your non-legendary Phaser 6022. That needs to be fixed. XEROX sales and service was better informed. As expected. We found the product and vendor. Again.